An Allpronix customer recently found itself in a predicament where it needed to monitor a flowmeter remotely, but also record the data on site with a paperless recorder. The RTU already installed on site performed the function by reading the flow rate from the flowmeter’s Modbus register. The problem was that the electromagnetic flowmeter the customer had purchased did not give a mA output signal, which is required by the paperless recorder. The solution was to introduce a device that could connect to the same Modbus network as the RTU, receive the flow rate from the RTU (Modbus master) and produce a mA output signal to allow the recorder to log the flow rate on a SD card. 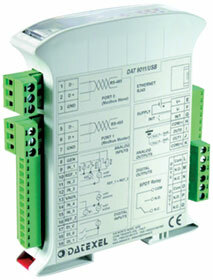 The Datexel DAT9011-USB was chosen for its capability to act as a Modbus master or slave, to perform the computation required without the need for add-on modules and the versatility it offers for possible future expansion. The intelligent module is able to control a network of slave Modbus RTU devices connected on a serial RS-485 line. It can execute the reading and writing of the field values and perform the logical and mathematical functions necessary for system operation and the management of up to eight data storage tasks. The data is saved on a USB memory stick and it is possible to access the saved files by means of the Ethernet connection. The device is equipped with one universal analog input channel, one channel for volt and mA input, two digital inputs and two relay outputs. An auxiliary source is also available to supply sensors in the field. By means of the Ethernet interface, or the RS-485 slave or RS-232 ports, it is possible to read and write the internal register values in real time. Moreover, it is also possible to program the control logic and request real-time data from the slave devices.